If I had to pick an era where I really identified with the music, I'd choose the 90's. That is when I was really into it where I bought a gazillion CDs (yah, that was then...) and partied to the tunes. So when I got tickets to the Earth, Wind and Fire with Chicago concert (yes this was awhile ago), it was a stretch. Viv and I weren't even born when these bands formed! Well on the bright side, we were a good 15 to 20 years younger than the majority of the crowd at Rogers Arena! 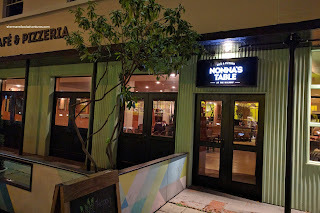 Prior to that, we ended up grabbing some dinner at Nonna's Table Cafe & Pizzeria with Lana Banana. Seeing how this was going to be a carb-fest, we started with the Meatballs featuring Campagna Farm-raised beef, pomodoro sauce, arugula and grana padano served with grilled focaccia. These tender and moist meatballs were mildly spiced while doused in a tangy and fresh-tasting sauce. 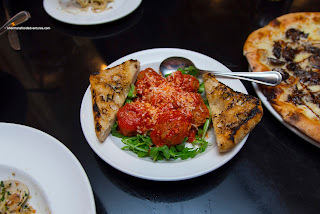 There was a certain pepperiness to the meatballs that were accented by a different type of pepperiness from the arugula. 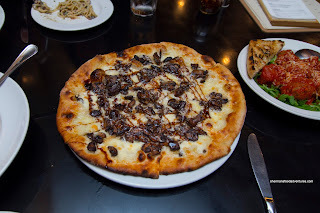 For our pizza, we ended up ordering the Funghi Misti with roasted mushrooms, bocconcini and shaved grana padano and fresh panna. The crust was firmly crunchy from the edge to the middle. I found it more "cracker-like" than the classic chewy and blistered type of crust. It was well-seasoned while the large amount of buttery mushrooms added plenty of Earthiness. The aggressive drizzle of balsamic reduction made everything a bit too sweet. 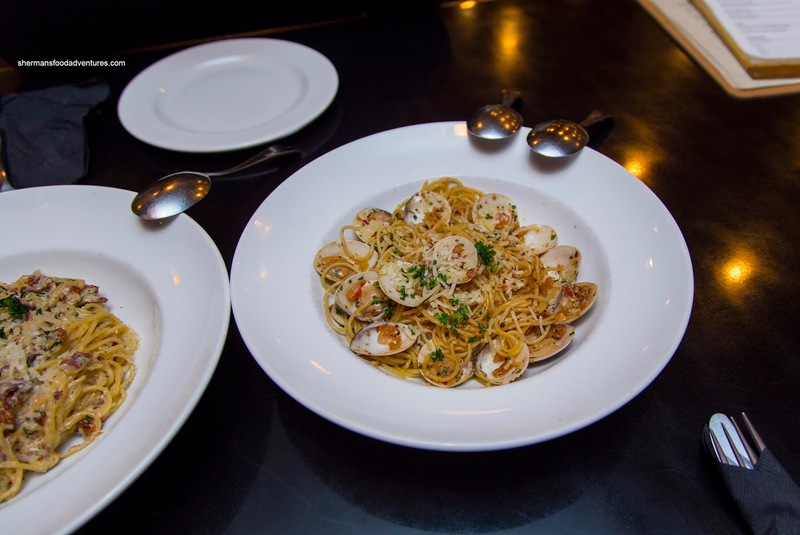 We decided to share 2 pastas including the Spaghetti alla Carbonara and Spaghetti alla Vongole. 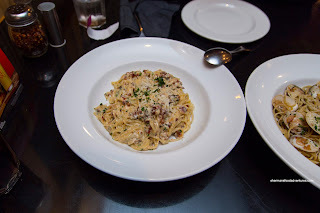 If we purely looked at how the carbonara tasted, it was on point and a winner. There was a plethora of nicely rendered bacon and shaved grana padano which afforded a rich saltiness. Furthermore, the pasta was al dente and properly salted. However, the egg had cooked through creating unappetizing clumps. We found the vongole much better executed with the same al dente spaghetti dressed in olive oil, plenty of garlic, chili flakes, white wine and fresh clams. There was a background brininess that was complimented by the heat of the chili flakes and garlic. Overall, we found the food decent for a reasonable-price. Nonna's may not be my first choice, but it is definitely fine for a casual meal.